CHARLOTTE -- Carolina Panthers quarterback Cam Newton spread some holiday cheer by hosting his "Christmas with Cam Newton" event, put on by the Cam Newton Foundation. 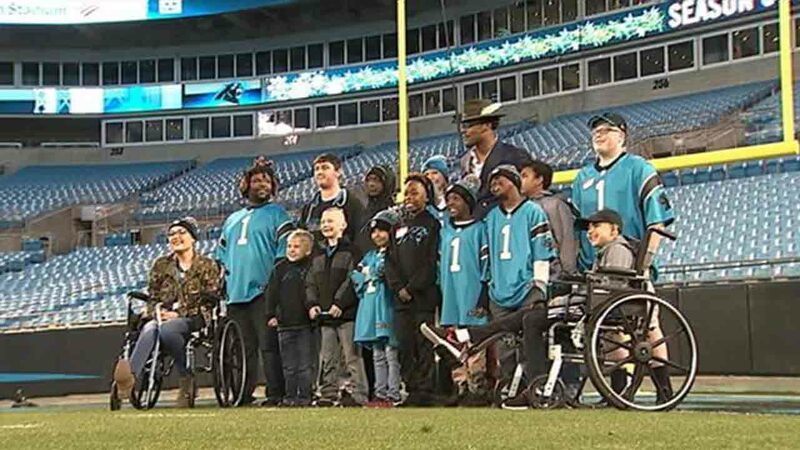 Fourteen children at Charlotte's Levine Children's Hospital were invited to Sunday's game against the Tampa Bay Buccaneers at Bank of America Stadium. The patients watched the Panthers beat Tampa Bay, 22-19, from a catered luxury suite. They also received a personalized number one jersey and met Newton on the field after the game, WSOC reports. And the simple gesture really meant a lot to the kids. "I just wanted a hug," said 15-year-old Ashling Beatty from Mooresville. "It's really special. (Cam) is a really good person." The patients were treated to a great game with a thrilling finish, as Newton scored the game-winning touchdown with 35 seconds remaining. About an hour after scoring that playoff berth-clinching touchdown, Newton interacted with the children, giving each one an opportunity to feel what it's like to be a Panther on game day. Newton said there wasn't a better way to end a Christmas Eve win than to share some holiday joy with those who need it. "Any time you get an opportunity to shine light on the good of the world, that's what I'm all for," Newton said. "Not only do I give them something, they bring on extra luck and we needed it."